There are a lot of $40,000 SUVs to choose from. Virtually every major automaker in the U.S. market sells an SUV model in this price range including Audi, BMW, Lexus, and Mercedes-Benz. They range from large SUVs built for passenger and cargo room such as the Chevrolet Traverse to premium compact models such as the Volvo XC60. Consumers have a lot of different needs from an SUV. Some want towing capacity; others want luxury, while others want passenger and cargo room. Ideally a buyer can get all the features they want at a price they can afford. When we consider the worst $40,000 SUVs, we look at models that miss on all of the above marks. Sure, a Ford Flex Titanium offers a powerful V6 engine and plenty of luxury, but is it really worth paying $45,000 for a Ford SUV? We think not. 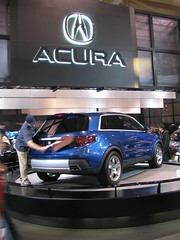 However, after considering all the SUV models in this price range, our vote for the worst $40,000 SUV is the Acura RDX. The 2011 Acura RDX has great underpinnings. It is built on the same platform as the Honda CR-V, the nation’s top-selling SUV. However, it misses the mark on a number of levels in the premium compact SUV class. The RDX is offered with just one engine choice, a 2.3-liter 240 horsepower turbocharged four-cylinder engine. This is the only model this engine is offered in among Honda/Acura models. While 240 horsepower is significant for a four-cylinder engine it is 20 less than the 2011 Kia Sportage SX while offering significantly worse fuel economy 22/27 vs. 19 mpg city and 24-mpg highway for the RDX. The RDX also costs about $7,000 more than a comparably equipped Sportage SX. The RDX does not offer substantial cargo room for a $40,000 model. It offers seating for five with no third-row seat. While it has comparable cargo room to class competitors such as the Audi Q5 and Volvo XC60, its 60.6 cubic feet of cargo volume is significantly less than its sibling CR-V, which has 72 cubic feet with the rear seats folded down. The RDX has also been criticized for its interior quality, which does not measure up to its price tag. And the model’s exterior styling certainly doesn’t break any new ground. The RDX also lags behind competitors in terms of safety. It received only a “Marginal” rating in a roof strength tests conducted by the Insurance Institute for Highway Safety and is not among the safest 2011 SUVs. The RDX’s roof was only able to withstand 2.9 times its weight. So is the RDX really the worst $40,000 SUV? Ultimately this is up to the buyer. At a minimum, it does boast Honda/Acura’s reputation for reliability and decent performance. Other models that may be considered for worst $40,000 SUV include the Ford Edge, Ford Flex, GMC Acadia, Hyundai Veracruz, Land Rover LR2, Nissan Pathfinder, Subaru Tribeca (which is reportedly being discontinued) and Toyota 4Runner. Which Model Do You Think is the Worst $40,000 SUV?